On Saturday we went hiking on Pimmit Run, which flows into the Potomac River near the Chain Bridge crosses the river from Virginia into the District of Columbia. 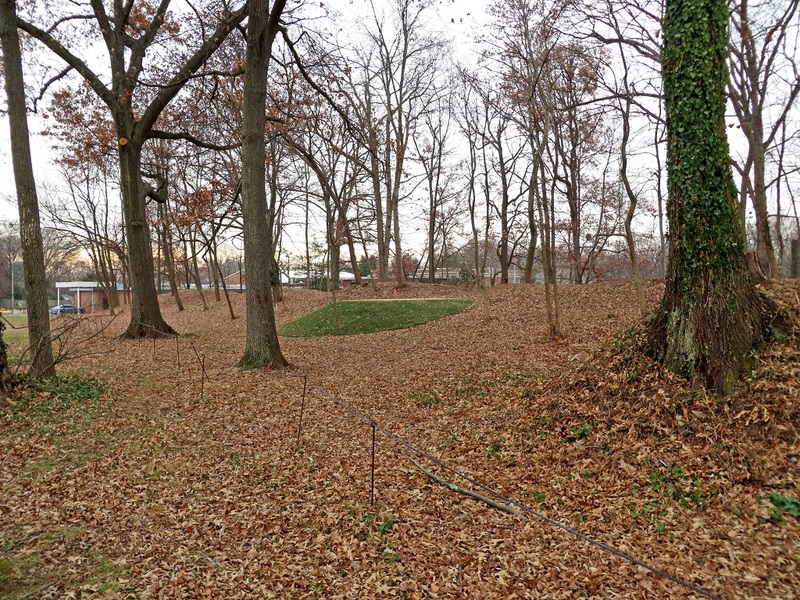 The hike started at the Madison Community Center, which is located where Fort Ethan Allen, one of the Civil War fortifications of Washington DC, once stood. You can still see a lot of the fort’s features; a section of the south wall of the fort runs just north of the parking lot we gathered in for the hike. 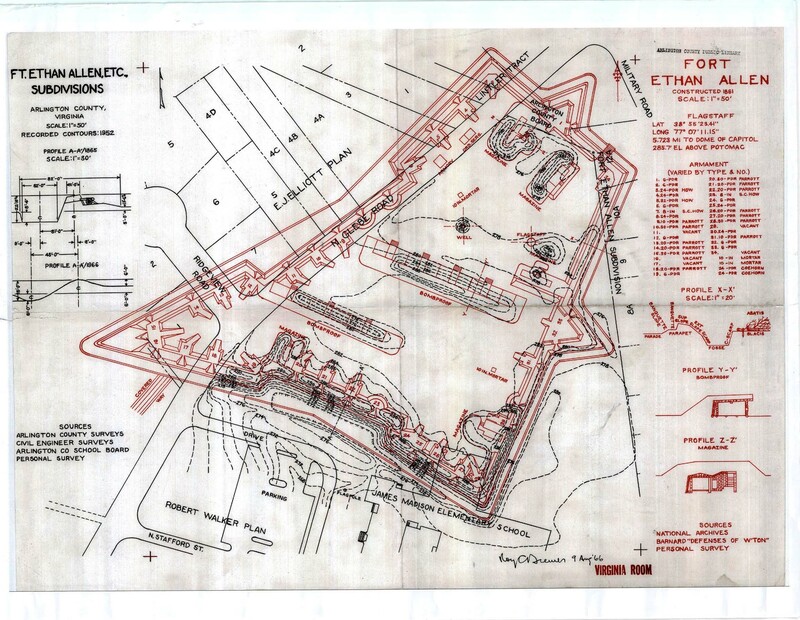 There’s a neat civil engineering overlay at the Old Glebe Civic Association website that shows a drawing of the fort superimposed over the city streets. The drawing was made in 1952, but the streets are relatively unchanged since then. 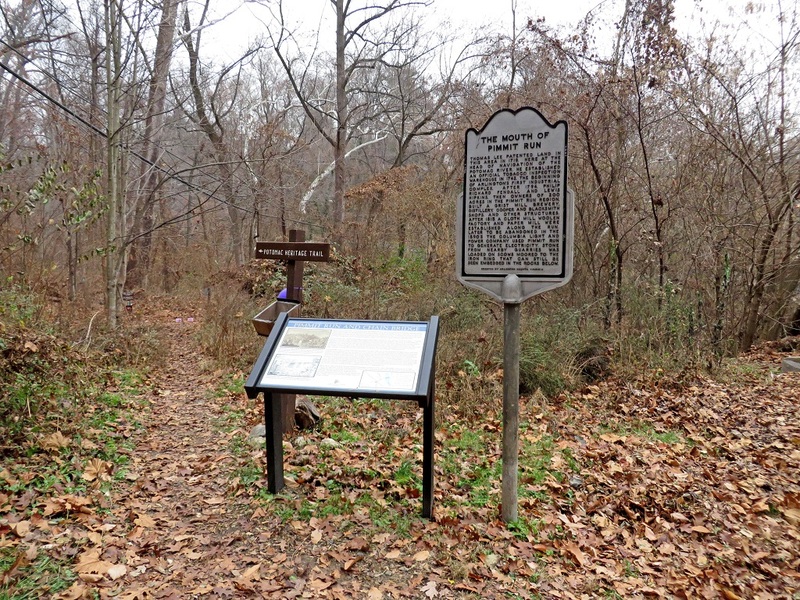 From Fort Ethan Allen we walked northeast along Old Glebe and Military Roads, Randolph Street and a steep bike path to arrive at the historic marker that stands at the intersection of Pimmit Run and Potomac Heritage trails. A mill once stood near this point that played a part in the rescue of the Declaration of Independence and other historic documents when the British captured Washington DC during the War of 1812. On the day before the arrival of British troops in Washington in August 1814, the documents were smuggled across the river in a cart to the mill, and subsequently into hiding in Leesburg, Virginia, where they remained until the Washington area was once more secure. 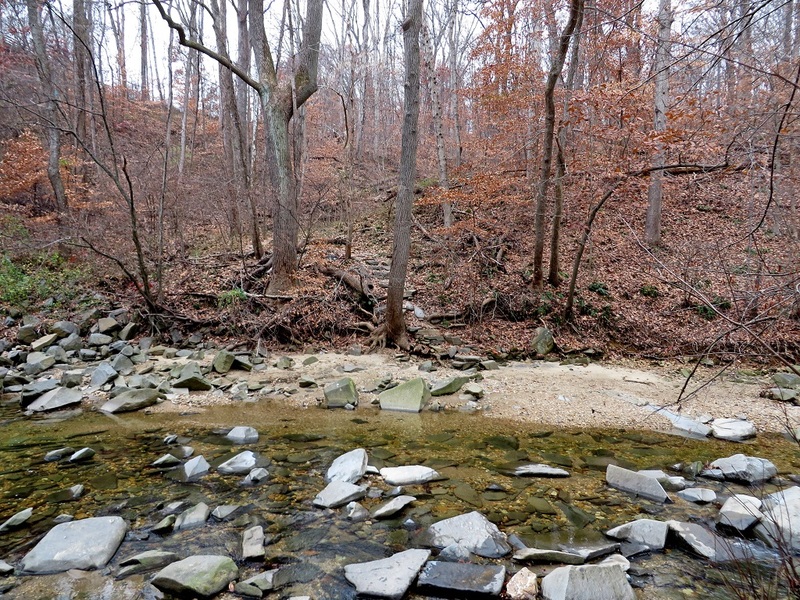 From there we hiked upstream along Pimmit Run Trail to a point where it passes under George Washington Parkway, where you can hop across rocks in the stream to ascend a trail leading to Fort Marcy, another of the Civil War fortifications of Washington. Well, I should say normally you can hop across the rocks: I was easily able to cross a few days earlier when reconnoitering the hike. 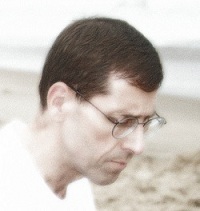 But it rained for a day and a half afterwards, so on Saturday we elected not to cross to Fort Marcy. The water was running very swift and, while not particularly deep, it was high enough to cover many of the rocks and make them slippery. The hazard was not so much splashing around getting wet, but rather the potential for a nasty fall and injury. As I mentioned, I was able to cross over a few days earlier and snoop around in Fort Marcy, so here’s a little about the site. The works are actually quite well preserved, but trees make it pretty hard to visualize what the fort was like during the Civil War. As this photo from the Library of Congress shows, the area was almost completely cleared of trees during the Civil War to provide building materials for the fort, firewood, and to clear fields of fire for the fort’s 18 guns. None of the fort’s period armament remain today, but there are a couple of cannon placed there today to help give you an authentic feel. 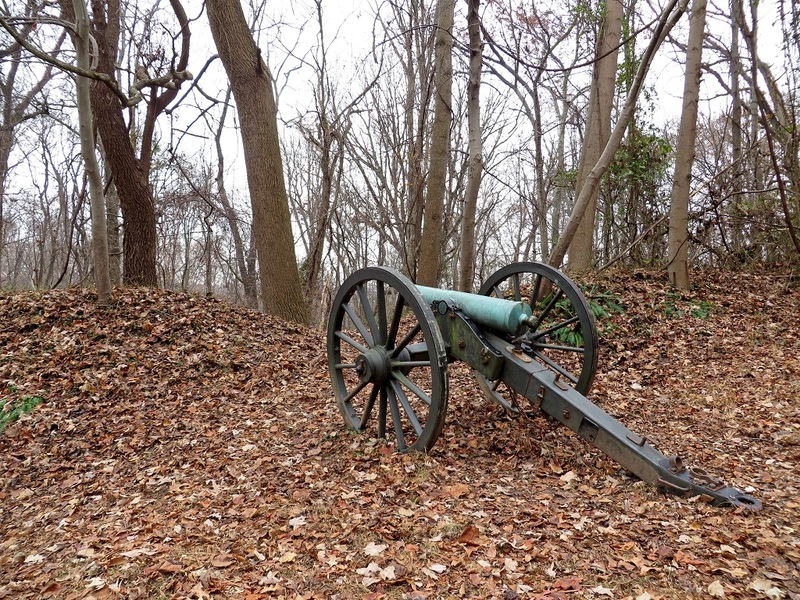 On a side note, the body of Vincent Foster, Deputy White House Counsel for President Bill Clinton, was found on July 20, 1993, on the berm in front of the cannon shown below, dead of an apparent suicide. Getting back to Saturday’s hike, we continued upstream another mile, crossing over several little tributaries along the way, until we reached Kirby Road. At Kirby Road we turned back and retraced our steps to our starting point Fort Ethan Allen / Madison Community Center. Because our crossing to Fort Marcy was thwarted by high water, we only managed about 4.5 miles of the planned 5.5-mile hike. But the steep inclines and muddy trail still made it a good workout and an enjoyable hike before the arrival of a winter storm brought snow, sleet, and freezing rain to the area on Sunday. Here is a Google map of our hike, including the side trip to Fort Marcy we didn’t quite manage. There is also a nice National Park Service brochure (pdf) located here, describing some of the background of the route between Fort Ethan Allen and Fort Marcy, but it does not include the rest of the route we took, up Pimmit Run to Kirby Road and back. This entry was posted in Hiking, History, Photography and tagged Fort Ethan Allen, Fort Marcy, Madison Community Center, nature, outdoors, Pimmit Run, Washington DC. Bookmark the permalink.